You may or may not be aware that board games are currently undergoing a revival. It was mentioned at work that we’ll be starting a monthly games night so I thought I’d list a good few of the modern board games I’ve amassed in the last year or so and why they’re way better than Battleships, Risk or Monopoly! This is a great game based around the historic french city of Carcassonne. The idea is to place tiles and build up a map. As you place tiles, you build roads and cities that you can place your “Meeples” on to accrue points. As your roads get longer and your cities get bigger you gain more points. You opponents however have the same idea so there is a lot of competition to stop other’s cities and roads getting too big and the tiles you draw are random so you never know what the next move will be. This is a co-operative game where all players are invested in discovering four treasure on a sinking island and getting off the island alive. 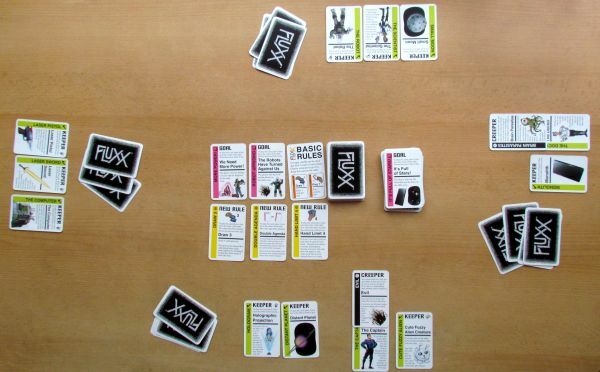 The games involves laying tiles at the start to form an island and choosing characters that have special abilities (such as a navigator to help other players move about). As the game progresses certain tiles begin to sink and limit your options as to how you can move around. You all have to participate to find the lost treasure and you all have to reach the helicopter landing at the end. You lose as a team or win as team. It can be quite tense, but good for team-building (I guess). This game sounds kinda twee and takes a while to play but is so filled with options, you couldn’t possibly get bored with it. Each player represents a family of dwarfs that live in a cave. The objective is to mine the cave for minerals and/or build up your farm of crops and livestock outside the cave to amass as many points as possible which are counted at the end of the game. Your choices can end up limiting you later down the line and there are only so many rounds (some of which you have to feed you family too so you have to make sure you have enough resources to do it). I love this game, and it plays well for up to 7 players. Talisman – an epic quest game where players fight creatures and each other to reach the crown of command to destroy all the other opponents. A long one, but great fun. Zombie Dice – a dead quick game – roll three dice, keep the brains you throw, re-roll the “runners” (the ones that got away – depicted by feet on the die) and set aside the shotguns. Take 3 more dice, roll again. You try and get as many brains as possible without being shot 3 times. If you do get shot 3 times, you lose all the brains you accrued. The next player then takes their turn the round continues. First player to 13 brains wins! Small World – on a map of limited size you try and occupy as much land as possible. You choose your race (orcs, giants, skeletons etc) who each have different abilities. You gain points each round for each land you occupy. You can choose to put your race into decline (which is usually a good idea after a few rounds) and chosse a new race to begin colonising again. Zendo/Xendo – I can’t remember how I came across this game but you can use anything to play it. I use lego bricks. It is a game of inductive logic so great for programmers/devs. One player builds two structures, one that matches a rule that they keeps secret and one that does not match the rule. The rule can be anything but keeping it simple is best. Something like “the structure should contain 2 different colour bricks”. The other players attempt to build structures that match what they think the rule is. If what they build that matches they can attempt to guess the rule. There are some other dynamics, but it’s great to get your brain whirring. if you have any questions or want any advice on what board games to buy, I should be able to help out. If any of you are fans of Will Wheaton (probably not), he has a YouTube channel called TableTop where he reviews games by playing them with C-list american celebrities. Mildly amusing, but quite addictive to watch.